While summer fruits might be gone for another year, with autumn come a whole new delicious bunch of vegetables and fruits like winter squash, cranberries and APPLES! Apples are everywhere you turn in the fall and are such a delicious and versatile fruit packed with nutrients and antioxidants that you can include in your dishes from breakfast to dessert. Apples are a crisp, white fleshed fruit with a red, green or yellow skin and belong to the Rose family of plants along with other favourite fruits like apricots, plums, cherries, peaches, pears, raspberries and almonds. While all apples are sweet and refreshing, their tartness and use very much depends on the apple variety you choose (more on that below). We all know that an apple a day keeps the doctor away…do you really know what makes the apple so healthy? • Polyphenols are a group of natural compounds found in fruits and vegetables that are classified as antioxidants and help to remove free radicals that cause damage to cells and tissues in the body. The powerful antioxidant ability of the polyphenols in apples is especially beneficial for heart health as they help to prevent oxidation of fats in the body which is a large risk factor for the clogging of arteries and other heart problems. • Recent research has found that these powerful polyphenols also help to regulate blood sugar by affecting the way our body processes carbohydrates and sugars. • A water soluble vitamin that acts as an antioxidant and is important for proper wound healing, infection prevention and helps our bodies to absorb iron better. • The main type of fibre in apples is soluble fibre which is important for keeping your bowels regular and healthy and is beneficial to help to lower your blood cholesterol levels and keep your blood sugar levels stable. • A mineral found in many fruits and vegetables that is crucial for maintaining for normal blood pressure and kidney health. Apples have different uses depending on their variety. 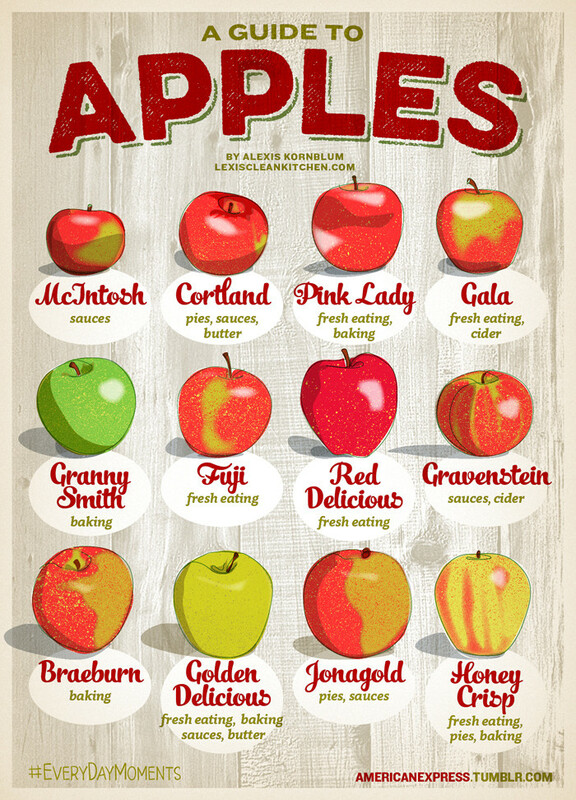 Tart apples (like granny smith or pink lady) are best for baking pies, crisps or cobblers; whereas sweet, mild tasting apples (like red delicious or gala) are better for fresh eating. The picture below is a great guide for how to use up your apples. Use the guide above to help you decide what type of apple will best suit your plans (whether it be baking, sauces or simply fresh eating). Apple season typically ranges from the end of summer into the early winter at local farmers markets but you can usually find apples in the grocery store year round which have been imported from countries in the southern hemisphere. When selecting apples be sure to pick firm apples with bright colour and inspect them for bruises or soft spots. Apples can be stored for a relatively long time (3-4 months) at low temperatures (2-4C) which can help to minimize any nutrient loss. Be careful though, one bad apple can spoil the whole bunch! A bruised or damaged apple releases ethylene gas which can decrease the shelf life of other apples in close proximity. Apple skin is extremely rich in nutrients so try to always eat the skin when you can after washing under warm water, scrubbing the skin with a small brush. If eating apples fresh, simply eat whole or slice in to bite sized portions. To stop apples from browning, sprinkle a little bit of lemon juice on the apple. If you have way more apples than you know what to do with you can freeze sliced apples in plastic bags with a small drizzle of lemon juice for future recipes. • Homemade apple sauce: combine 3lbs peeled, cored apples, ½ cup apple juice, juice of ½ lemon, ¼ cup brown sugar, 1 tsp cinnamon in a large pot and cook over medium heat stirring occasionally for 25 minutes. Carefully puree in a food processor or blender (not too full) until smooth. Store in the fridge and eat as is or serve over pork chops, over ice cream, over pancakes or anywhere else your heart desires! • Apples and peanut butter is a great pre-workout snack!